Detonation. It’s something many car enthusiasts pretend to understand but all too often we see the tell-tale signs that not enough people are up-to-speed. Blown head gaskets, cracked pistons, damaged bearings – these are the sort of terminal failures that result when your engine is severely detonating. So what are you supposed to do to avoid becoming the next victim of detonation? 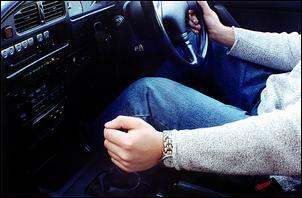 There are several situations where detonation may occur in normal driving. One of the most frequent causes of detonation is driver misuse – driving in a gear that’s too tall for a given engine rpm and load. This typically happens when a driver doesn’t bother down-changing to exit a low speed corner, climbing a hill in top gear, or accidentally slotting the gearbox into the wrong position. In a factory high performance vehicle, detonation may also be caused by inadequate fuel octane. 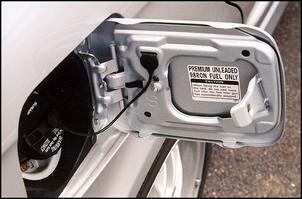 Take notice of the fuel labels inside the fuel filler flap – if premium unleaded is recommended, then that’s what you should always strive to use. Some cars must be run on ultra high octane 98 RON fuel only – the twin-turbo Subaru Liberty B4 is an example. Note that the higher the fuel octane you use, the better. Some vehicles are also very sensitive to driving conditions. If the car is idling around in traffic for extended periods, the resulting heat-soak in the intake manifold, induction system and under-bonnet heat can lead to detonation when you resume driving. This is particularly common when the ECU’s intake air temperature sensor is located near the start of the intake tract rather than in the intake manifold. 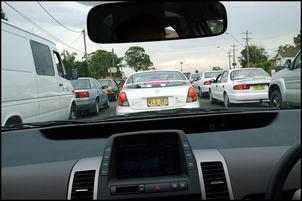 These are the typical situations where detonation may occur in normal driving. The next question is: how are you supposed to identify detonation during these conditions? Detonation is usually heard as a ‘ting-ting-ting’ noise that resembles marbles rattling around in a bag. In worst-case scenarios, this ‘ting-ting-ting’ might continue for several seconds while the driver continues unaware of what’s happening. On the other hand, it might be nothing more than a single ‘ting’. Whatever the case, be aware that any amount of detonation is bad for your engine. 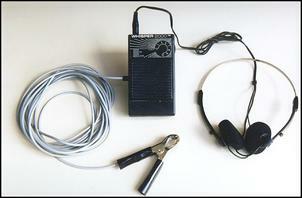 In addition to listening by ear, detonation can also be detected using electronic devices. 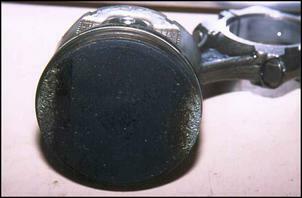 Detonation can be measured with various techniques but the most common is to use a sensor mounted on the engine block. This sensor listens for sounds transmitted through the block – the frequency of detonation is identified amongst the myriad of other mechanical frequencies. Several stand-alone detonation sensor kits are available in the aftermarket, but the easier approach is to access the knock sensor input to the ECU (where fitted). 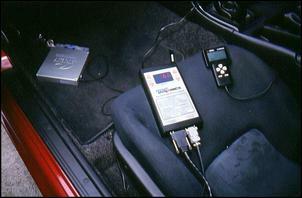 There are various LED-style meters in the aftermarket that are designed to connect to the ECU’s knock sensor wiring. We’ve told you that any amount of detonation is bad for the engine but it is generally accepted that there’s two types of detonation – tolerable and intolerable. Tolerable detonation occurs at low rpm, is barely audible and lasts for a short length of time. This type of detonation can be experienced in a variety of production cars – especially those where the manufacturer is striving to achieve a wide spread of torque with a relatively small capacity engine. Adding extra ignition advance is a sure-fire way for tuners to improve throttle response and torque but it does come with considerable risk. If ignition occurs too early in the piston stroke, the resulting pressure wave can ignite the air-fuel mixture in various parts of the combustion chamber, causing detonation. Note that overly aggressive ignition timing is probably the most common cause of detonation in modified vehicles. 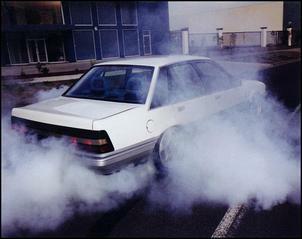 Another common practice in tuning circles is to lean out the factory air-fuel ratio to achieve a higher engine output. Well, the factory runs the engine rich for very good reason – to control combustion temperature. By leaning the air-fuel ratio and increasing combustion temperatures, the chance of detonation is increased. Induction air temperature is important in all engines – naturally aspirated and those with forced induction. In instances where an exposed air filter has been mounted under the bonnet, the engine ingests induction air that’s perhaps 40 degrees Celsius hotter than it should be. This induction air heat is frequently a contributing factor to detonation in modified vehicles. In the case of a turbo or supercharged engine, the importance of induction air temperature cannot be overstated. Induction air from a turbocharger can reach beyond 110 degrees C – and that’s absolute murder for an engine. Proper intercooling and/or water injection is a must. An engine’s compression ratio also plays a major part in the occurrence of detonation. In a naturally aspirated engine, the compression ratio is generally set up to around 10.5:1 in order to run normal unleaded fuel. Compression ratios of around 13:1 can be accommodated by using high-octane unleaded. Be aware that if you’ve had a hi-po motor built with a too-high compression ratio, you’ll always be chasing your tail with band-aid fixes to detonation problems. 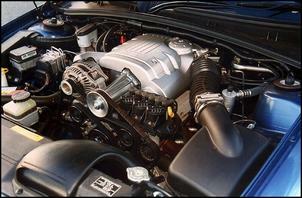 In the case of a forced induction engine, the static compression ratio is usually kept down to between 7.0 and 9.5:1. This relatively low static compression ratio is necessary to accommodate the extra air mass that is forced into the combustion chamber by the turbo or supercharger. 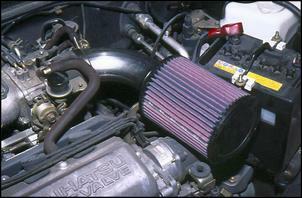 This forced induction air (ie boost) increases the engine’s effective compression ratio. 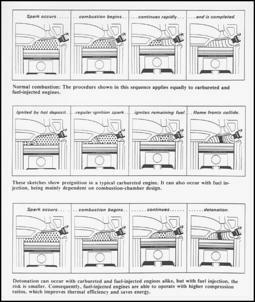 The amount of boost an engine can withstand before detonation depends largely on the static compression ratio. If the static compression ratio is relatively high (which helps maintain off-boost driveability) the scope for lots of boost is limited. There are several other causes of detonation in modified engines but those listed here are generally the most common. Poor combustion chamber design used to be a common cause of detonation, but this is generally not an issue for modern design engines. Note: high-octane unleaded is recommended for any engine that is mildly modified. It’s simply not worth the risk filling with normal unleaded. 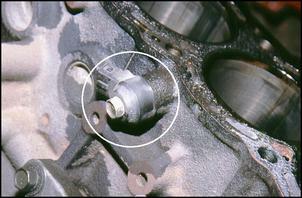 High performance Japanese import vehicles are especially prone to engine damage caused by detonation. This is because the engine and management system are configured for use with the 100 RON fuel available in <?xml:namespace prefix = st1 ns = "urn:schemas-microsoft-com:office:smarttags" />Japan. Import the car to Australia, run it on local 95 RON premium unleaded – or maybe 91 RON normal unleaded – and you have a recipe for disaster. At minimum, we suggest using 98 RON fuel and keeping an ear out for detonation at all times. A better solution is to take some of the steps outlined in Part Two. In Part Two – the final - of this series we’ll examine ways to avoid detonation.